When I’m craving a salad that’s not only delicious and bursting with flavors, but also hearty, very satisfying, and extremely nutritious, I turn to this Smoked Salmon and Lentil Salad. 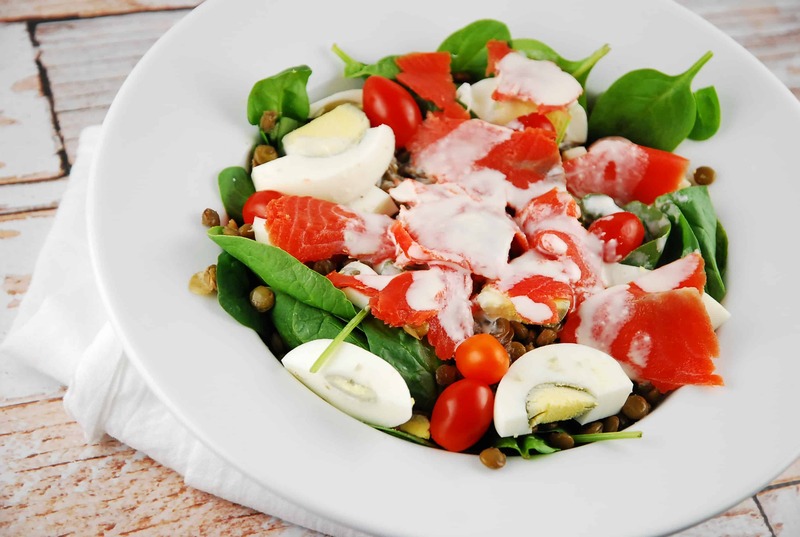 I usually always keep a few hardboiled eggs in the fridge, and with minimal prep, this salad can be put together quickly and easily. Loaded with protein, fiber and Omega-3’s, this salad is great for a heart healthy lunch idea! You can use leftover cooked salmon with this too, if you prefer, but I love to treat myself to some smoked salmon on occasion. And it works especially well with the tahini sauce in this dish. I also like to thin out the tahini sauce with some water and/or lemon juice, as the Trader Joe’s one I use is really thick. At just 7 Points for the whole, huge salad, this Weight Watchers Recipe is sure to become a favorite of yours, too. Chock full of fiber, protein and Omega-3 fatty acids, this filling and flavorful salad is one seriously healthy meal. Not only is it incredibly delicious, but you can throw it together quickly and easily too. Place spinach in a bowl or large plate, and top with remaining ingredients, and squeeze lemon juice over everything.